If you have kept an eye on the vape scene over the past year or so, you will have most definitely noticed one staple mod that keeps on showing itself. The RX series from Wismec has been a strong contender in the market since it’s release. It has solidified it’s place in the market due to outstanding performance and remains a favorable go-to device for most vape enthusiasts these days. Click Here to Check Out the RX200S! Click Here to Check Out the RX2/3! Wismec teamed up with American designer JayBo to create the acclaimed RX series of triple and now double battery box mods. With the RX being a staple in most vape reviewers/consumers artillery, I’ll tell you why I keep coming back to this mod. I’m going to talk about battery life, temp control mode, ergonomics, looks, performance and build quality. In addition, I’m going to summarize the differences between the RX200S and the latest RX2/3. 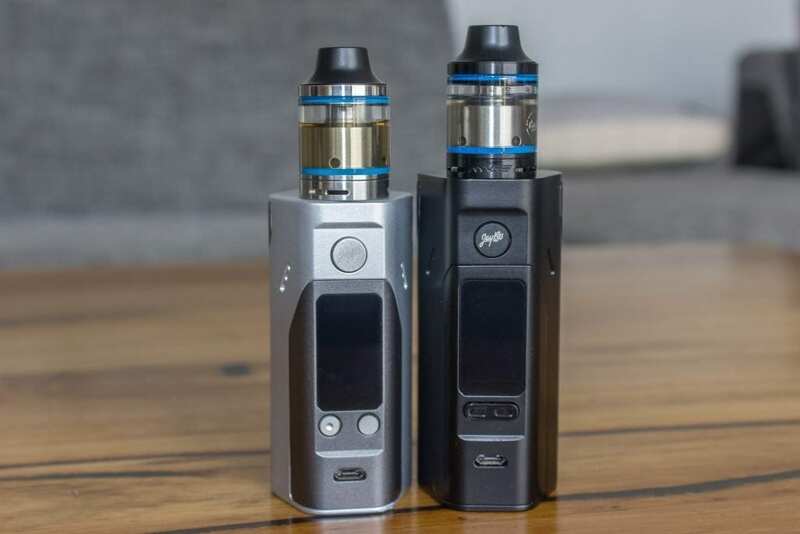 The main difference that the RX2/3 offers is a modular design, meaning that you can change the back cover to accommodate either two or three batteries. The RX200S is a straight up three battery mod, which can only be run as such. Many people have tried to run it on two batteries and it just does not work that way. The difference in the back cover mechanism means you have to engage a button on the bottom of the mod to remove it. Where on the previous models, you just had to pull off the battery cover which is held in place with magnets. The three battery cover houses the third battery in the cover itself and has a terminal that needs to make contact with the body to engage the extra power. The chipset automatically adjusts when using two or three batteries, via it’s Auto Switching Power Output feature. This design appeals to multiple users giving them the ability to go with a smaller size form factor while still offering the same functionality. The only trade off here is reduced battery life and a drop in overall wattage output – compared to that of three battery mode. The only other difference, obviously apart from size and weight is the button layout. The RX2/3 offers the same size and feel on the fire button as it’s predecessors, which is a nice big clicky satisfying button. The separate up/down selection buttons have been superseded with a single rocker type button. This means that you make your selection, either up or down, by holding the button either to the left (down) or to the right (up). For me at the end of the day, this really only changes the aesthetic of the mod – as ultimately the single button does the same as the two buttons used to. The screen on the RX2/3 is exactly the same as the RX200S. An upgraded 0.96 inch horizontal display which is a step up from the smaller 0.69 inch vertical screen that we saw on the original RX200. The menu and navigation system is exactly the same on the RX2/3 as the RX200S, with all of the same short cuts to get into various parameters for editing of your required settings. Nothing different here. 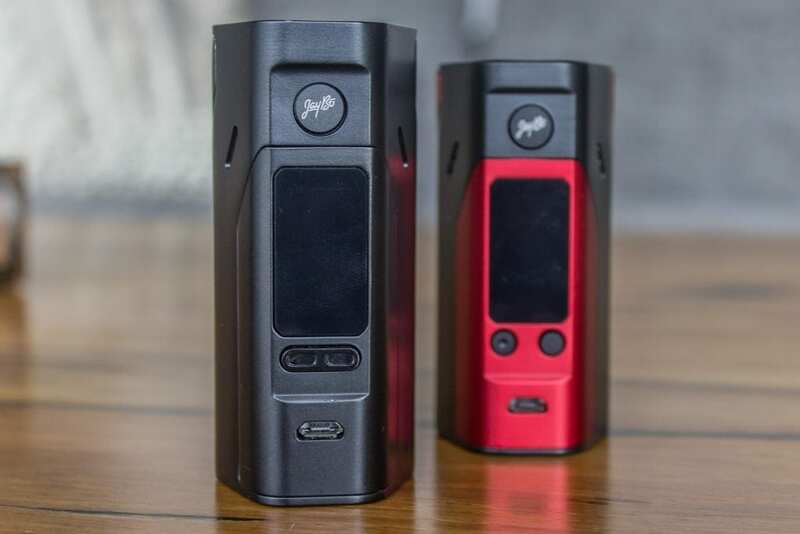 Height wise, the RX200S is 84mm high compared to the RX2/3 which is 88.7mm high. You can see the comparison in height from the pictures, I’ve used the same atomizer on both mods, so you can visualize the difference for yourself. The height difference is only 4.7mm between the two body shapes which accommodates the difference in cover mechanisms. Length and width for the RX200S comes in at 50mm and 40mm respectively. The 2/3 has a width of 40.2mm and a length of 50.1mm with the larger back cover and 34.5mm with the smaller cover. Weight wise, obviously the two battery configuration will be lighter considering there is one less 18650 on board. The benefit of utilizing the two battery configuration also means that the mod is easier to carry, taking up less room in your pocket. The RX200S and RX2/3 in three battery mode is not really pocket friendly as it takes up a lot of room and has a considerable weight. Ergonomics wise, I really enjoy the way that the RX200S and RX2/3 conforms to the natural curve of your hand. And with the RX2/3 in two battery mode, it is also really nice to hold albeit a little squarer than the RX200S. I find that the most comfortable position I hold the RX2/3 in, whilst using two batteries, is somewhat sideways using my pointer finger to engage the fire button. The matte finish an anti-slip finish and resistant surface feels really nice in the hand and attests to the great build quality and feel of these mods. In terms of build quality, I find the RX2/3 to be as solid and robust as the RX200S. Both are made from aluminium alloy which is resistant to corrosion and rust. These mods are built to last and can take a beating. I accidentally dropped my RX200S on a tiled floor whilst I was paying attention to something else and it came out fine. The back cover just came off and there was not even a blemish on the mod to be seen. It did make a mighty crash sound though. I’ll be upfront and say I’ve never had an RX mod fail on me. Many people talk about the 510 pin issues on the original RX200 and how they are unreliable, I have yet to experience any hassles with it. I do believe that since the RX200S the 510 spring has been enhanced eliminating any further issues this may have caused. Every atomizer i have attached to the RX has not had a problem registering and they all look good sitting atop these mods. In a world that is all about customization you can choose the battery life that suits you. With the RX2/3 if you want less battery life, but a more pocket-able device, you can choose to go with the two battery configuration. If you are after more battery life and more power and you don’t mind a lager, heavier sized mod – go for the three battery configuration. Wismec recommends using an external charger for all the mods in the RX series, which is certainly a good thing in my opinion. Here at VapingCheap, we always recommend vapers to charge their batteries in an external battery charge as it is just must safer. The last thing you want to happen is your batteries becoming unbalanced, which is not a good thing in regards to batteries that are married. Also, if you are considering buying one of the RX devices, you need to be aware that the batteries need to be of the same make and model. You need to keep these batteries married together to ensure that they are being charged and discharged at the same rate. Wismec also recommends to keep swapping the positions of each battery in the mod. This also affects which charger you already may have or opt to buy. Some chargers have two bays, some four and go up from there, keep in mind the cost also increases the more bays are included. Reverse Polarity Protection means if you accidentally put the batteries in the wrong way, the mod will not work and advise you. This is quite hard to do given the polarity for each is labelled clearly on the battery sleds. Temp Control modes save battery life, reduce e-liquid consumption and remove dry hits from the equation. For Ni200, Ti and SS all have preset TCR values embedded in each option. If you like to fiddle or these preset values are not to your liking, there are 3 memory modes within the custom TCR mode. This enables you to set your own custom heat coefficient for your wire of choice. When using TC you can fire atomizers built as low as 0.05 ohm. Wismec have made it very easy to update the factory firmware on all RX hardware. 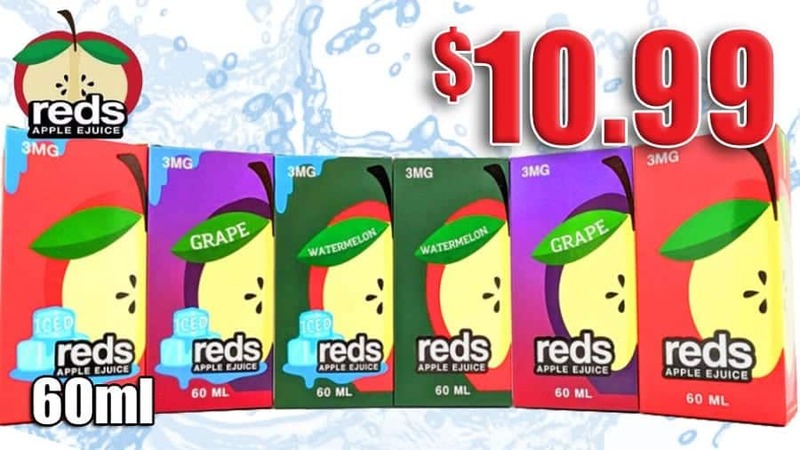 They accommodate for both Mac and PC users with a very quick, hassle free download. Simply download the firmware program for your hardware version and connect via the included USB port. The program will do the rest. There is also easy to download custom firmware for the series via third party sites that offer custom logos and fonts. 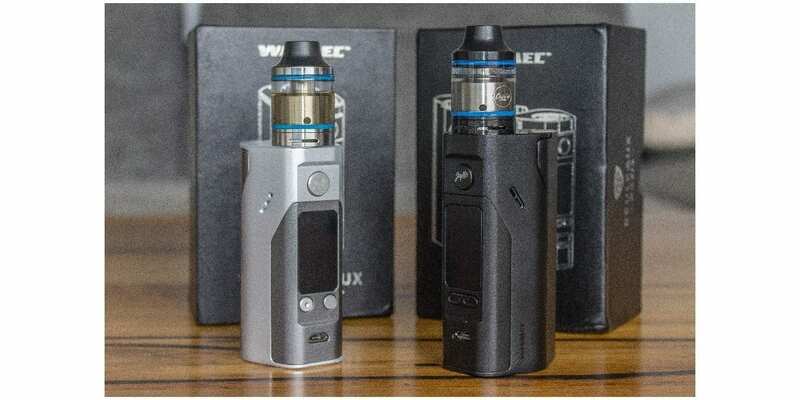 Talking about output, Wismec have upped the game on the whole RX series with firmware upgrades. At the time of writing, the new firmware allows the RX200S to fire up to 250watts! 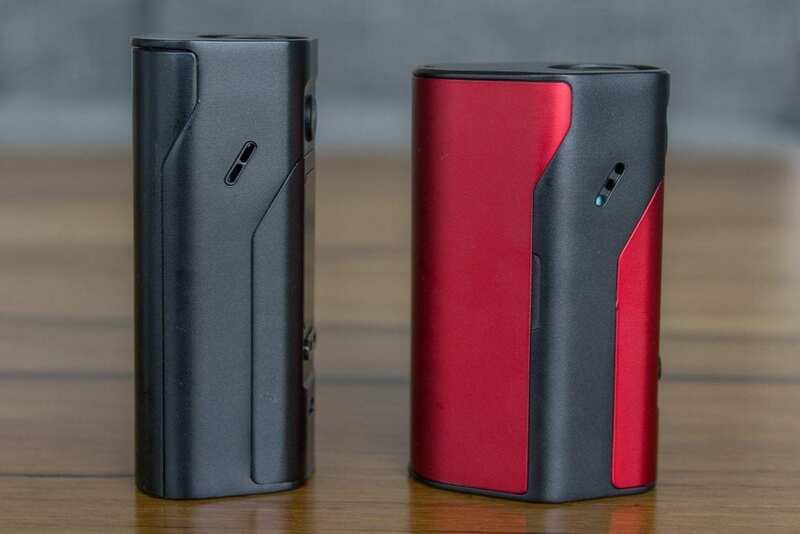 The RX2/3 is now capable of the same wattage output in three battery mode and it has stepped up to 200 watts in two battery mode – initially this was 150 watts. Custom logos are now available in each version via the firmware upgrade tool. Preheat is another custom option that enables you to set an initial preheat wattage that lasts for a predetermined amount of time before going back to the pre-selected wattage as normal. Think of this as a purely customizable ramp up time for your RDA and RDTA which is adjustable in 0.1 second increments. You get to this setting by holding both the fire and up button simultaneously while the mod is powered off. Then cycle through the options by pressing the fire button, make you selection with the up and down buttons. Press the fire button a few times once your done and turn your mod on to enjoy the new ramp up time functionality. I’ve just checked the latest firmware release notes for each of the RX models and they now all offer the preheat mode as well as the aforementioned updated power output. The RX2/3 is truly the customization king, with the interchangeable back doors it can be a two or three battery mod. 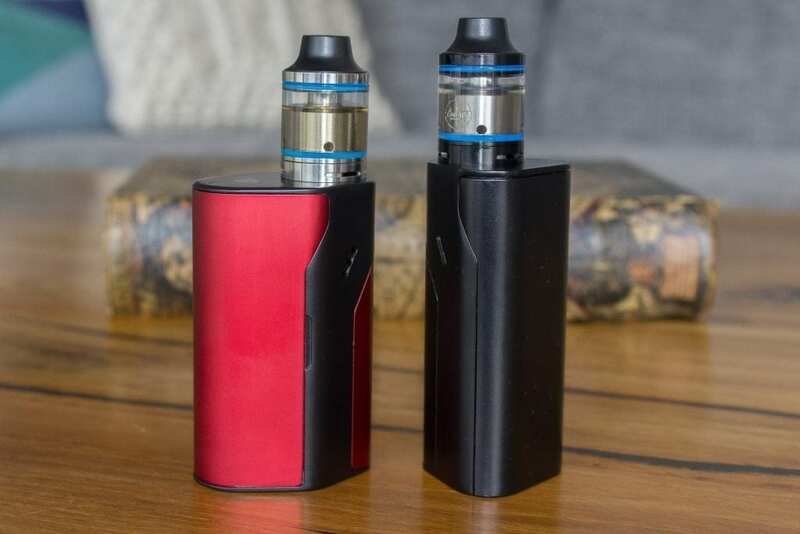 And along with the RX200S, it can be customized in terms of looks with replacement covers in different colors. Remember you cannot, however, interchange covers between the RX2/3 and the RX200S. They simply will not fit. At the end of the day, either way you go, given the firmware upgrades these mods will deliver the same performance and options. It just comes down to your convenience and your preference – possibly budget. If you need to save some cash by buying the older versions and upgrade your firmware – you will have the same net result. Remember to factor in the cost of your batteries and charger. If you know a three battery mod is for you, then it’s a very clear choice. However if you have pocket-ability in mind and know you have the need for only two batteries then the RX2/3 would be more up your alley. Every time I go to pickup one of these mods, they give me exactly what I want without wavering or compromising on performance. I do not hesitate to recommend either of these mods from Wismec and I hope that this summary has given you some insight in what to think about when considering your new mod.